The Allis Chalmers D17 was one of their best selling models. It was built from 1958-67. Between those years 84,914 of these orange beauties were built and were sold for around $5500. The D17 featured a power-director hand clutch transmission that was four gears forward and one reverse gear. The AC D17 had power adjustable rear wheels, and a traction boost system. With the hand lever clutch it allowed for on the go shifting between the direct and lower drive and a neutral allowing the PTO to continue power. 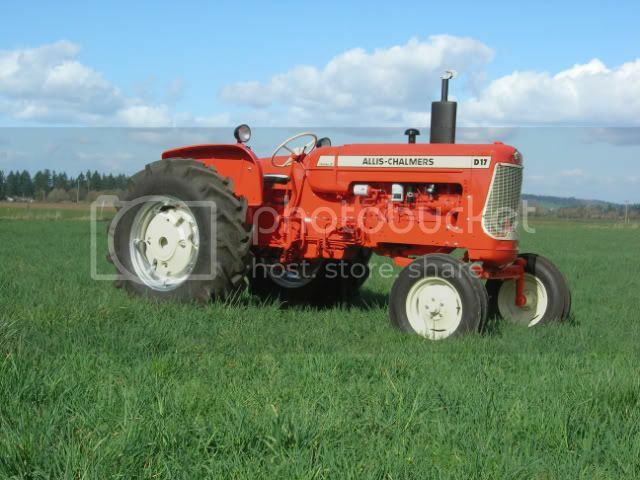 Allis Chalmers made the D17 in 3 different engine types, regular gas, LP gas, and diesel. The gas engine put out about 52.7 hp, the LP gas engine produced about 50.8hp, and the diesel produced 51.1 horses. Here are the years for serial number identification which are located on the left front torque housing. can you tell me what year my tractor is by these #s d17 17933 any help would be great. Rick: Your D17 is a 1959 with that model number. Thanks for your question! BRIAN THE D-17 WEIGHED ABOUT 4,660 POUNDS. Does anyone have parts on an Allis Chambers D14? My husband has a D17. A friend of his has a D14 and wants to restore it. Thank you. Whenever I move the lift arms on the back of my 1959 D 17 it loses fluid internally. Could someone tell me what i’ll need to fix this? D17 series 4—–lower left hand side of instrument panel there is a red light—-power directive—-oil pressure light—–if light is on is it low on oil or oil need change—comes on periodically. I need a power director clutch assy, for D17. If any one has one, let me know. I have a D17 Series IV Diesel with power steering. The steering went out. I can turn the steering wheel and nothing happens. What should I look for first? I have a D17 Series IV and the steering went out. Where should I look first to start repairs? I have a D-17 Allis Chamers and it is blowing oil out of the exhaust. I have new parts to fix but can’t get the sleeves out of the block and head. Does anyone have any advice? Thank you. I have a 61 D-17 when you push in the clutch the gears in the trans continue to rotate and you can’t shift it into a gear.This does not happen every time.The pressure plate looks like it working when you look through the inspection hole. Can anyone help? I need a rear wheel clamp for a 1949 Allis-Chalmers “B”. Does anyone have one? Need some help. Have a D17 that was repainted by father-in-law before he passed. All I got to go on is the stamped D17 3956 on the transmission? Can someone tell me what this number means? Looking for information on the locations of decals where they go on D-17 series II. I know where some belong but not all. If someone could help would appreciate it. I just purchased a D-17 and it has serial number 3524. Does that make it a 1957 model? Is it possible to change the governor fly weights on a D17 with powersteering with out removing the governor? What is the color of the outside of front wheel hub on d17 3 series? I have ’64 D17 gas, does anyone know where to add hyd oil? I need kit to rebuild oil pump on D17 diesel Allis Chalmer. Does anyone know where I can find one? How do I find the year if the torque tube has been replaced? The engine serial number is 17-41163-m. The number on the tube is D17 6173 d but the tractor is a series 4 and gas, any help? Thanks. Where do I find the serial number to help me know what year of D17 I have? I need to know where to add hydro fluid and trans fluid to my D17. Need to find a complete detail set for series for the 17 with three point hitch. Brother is working on an Allis tractor, we wants me to find out what year it is and what the original color and where stickers are. The Number he gave me is D1711854. Can someone help me out. Needing the short hydraulic line for central valve and spool assembly for D17 Series IV. Any suggestions on a dealer that would have it onsite? Liz, your brother’s tractor is a 1958 model. I’m sorry I do not know the answer to your other questions. Looking for a ram cylinder seal kit for D17. Can anyone help me? Just replaced the gas cap on my D17 with a cap from Farm and Fleet. I believe the 17 is a 66 or 67. Cap fits perfect but it doesn’t vent and the tractor shuts down. I’m leaving it a little loose for now, but what is the fix? Do I need a different gas cap? Where would I get one? How do I determine which is no 1 cylinder, no 2, No.3, No.4 on an Allis D17 gas? My D17 resembles a 1962 but the serial # is 109009. Can anyone tell me what year it is? I need a power steering pump (belt drive) for my d17 allis chalmers. Does anyone know where to find a remanufactured pump or a rebuild kit? I have a 1961 D17 gas, It looses drive on hills when warm, any ideas where to look ? was bought new in 1965. Any help would be greatly appreciated. How do you install brake bands on a 1966 model? Any help would be appreciated. Thank you! Have 2 D17 need to sell. One runs but smokes. The other is a parts but still in good shape.